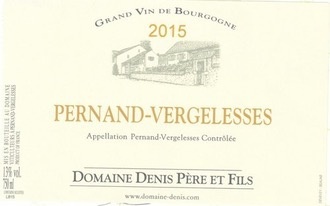 Wine Domaine Denis Pere et Fils Pernand Vergelesse Blanc 2015 - Royal Wine Merchants - Happy to Offer! In 1940, Raoul Denis, 3rd generation winemaker from the prestigious Hospices de Beaune and his wife decided to buy a small plot of land and continue the family tradition. By 1972, their land had become a part of the Vergelesses appellation. Three generations later, the winery is still owned and run by the Denis family, who work hard to produce wines that are an elegant expression of their region. The Chardonnay vines are farmed with traditional methods and enjoy a southwest orientation and ideal marl limestone soils. The grapes are fermented in oak barrels, then aged in French oak for 12 to 14 months.